Each year, graduating students in Portland State’s Master of Urban and Regional Planning program produce community-based applied planning projects for Portland and other local communities. This year’s projects are now available online in PDXScholar. 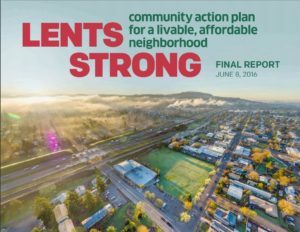 A new MURP project focuses on Portland’s Lents neighborhood. Planning projects require the development and evaluation of alternatives and include recommendations for courses of action. They are problem-centered and geographically-focused, and incorporate innovative public involvement efforts. Workshop projects have won an impressive fifteen state and six national awards in the past twenty years for the creative problem-solving evident in the products. Learn more about MURP projects. View and read MURP projects through PDXScholar.